As part of Jio's commitment to the 'Digital India' vision, your Jio Number 7012###### is now active on the Jio Welcome Offer. This free Offer is valid till December 31st, 2016, with all existing benefits. To provide feedback on our service and to manage your account, download the MyJio app, click www.jio.com/GetMyJio. 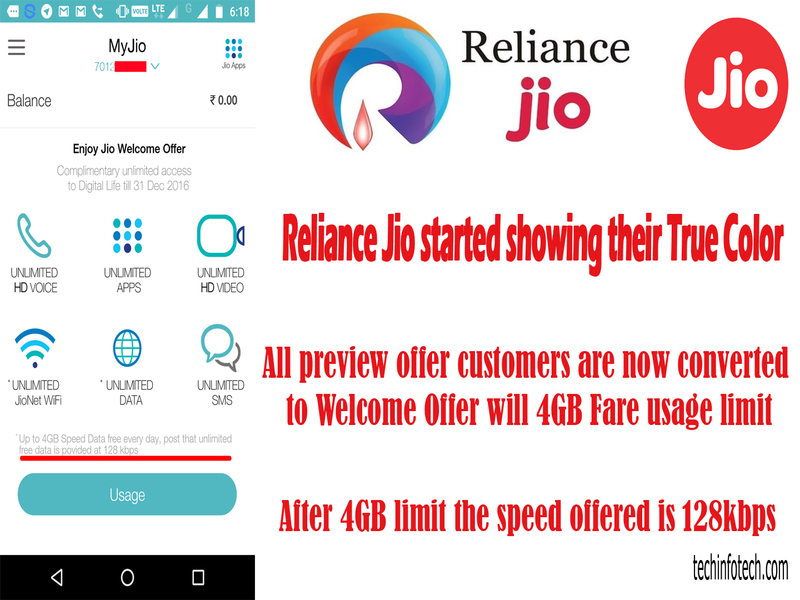 I am already on Jio Preview Offer, what is the impact on my plan? Will I not get the unlimited offer any more? If you are an existing Jio Preview Offer customer, you will be automatically migrated to the Jio Welcome Offer on 05th Sept, 2016. As a part of this Offer, you will continue to enjoy unlimited HD voice & video calling, unlimited SMS, high-speed data and access to a host of Jio premium apps till 31st Dec, 2016. Some days before I went to one of my friend's home. I went there for some personal reasons. But when we were talking he told that he has some problem with his laptop. The problem was that some of the keys on keyboard were not working. He made the contacts with the hardware vendor but they said that as laptop was an old model there is no stock of that keyboard and will take some time to get it replaced. He asked me if there is any quick fix for this issue. I said even if I'm not a hardware expert I will make a try and then I took the laptop to my home. I went through it and fixed all the keys except the key "A". The circuit associated with key "A" was physically damaged. I was thinking what else can be done to resole this issue, then I thought that he could be opted for OnScreen Keyboad (Type OSK.exe on RUN) but then it was not a solution for him because it takes time and he is a chatty boy! Then another solution was to use Desktop USB keyboard on his laptop. But as you know it also has some drawbacks. Then I got an idea, that is to remap keyboard. Remapping keyboard can be done through some registry hack but it also takes some time. Then I remembered about a free portable program that remap keyboard with some clicks :) , its called MapKeyboard. By using this I solved the problem. Sometimes you might also come across the same problem. Then you can also try this. Here is it. Its a very simple program. In my case the key "A" was not working so I changed it to key " ` " as its a rarely used key. To remap a key select a key as shown on the above screen shot and then remap it to the key that you think is appropriate. Then click "Save layout". Sometimes a warning message might occur, click continue and log-off or restart your computer / laptop that's it. MapKeyboard needs Microsoft .Net Framework 2.0, if you don’t have it installed, download it from here. Hi there, belated new year wishes, this is my first post in 2012 :-) . I am really very happy! You know why? On Jan 1st 2012 I visited a place that I was eagerly waiting for 20 years to visit. Twenty years, a long time, isn't it? Anyway its NIRANAM, a beautiful cute village, where I spent my childhood. You know that was a great experience. Everything is almost same as before. We were living there in a rented house. It was a normal style traditional house. But now the house is no more there, it has been rebuilt. In front of our house there is a stream which ends in paddy field. When i look around there was full of greenery. A duck farm is there. Even now i can remember, In every rainy season almost every part of the village was in water. At that time the youngsters there used to catch fish in large quantity using various types of fish nets. I also had a Fish-hook with which i used to catch fish. I really enjoyed that. That days were really wonderful. 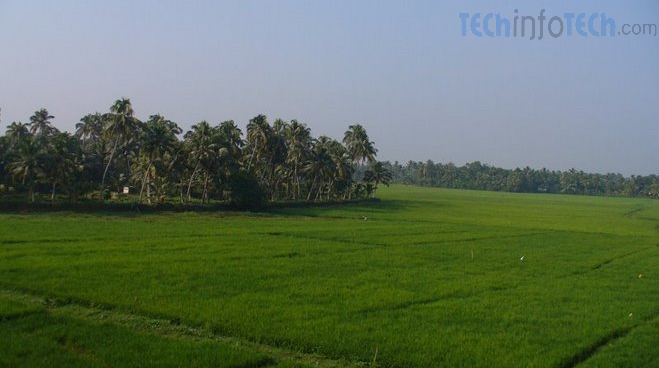 Actually today also there is not much changes, the paddy fields are there, the stream is there, the houses there is almost the same expect some new homes the people are also same. When I was there I did not know all the people with their names but every single face was there in my mind. Now also I can clearly remember their faces. When I went there I was able met many of the faces but some of them were not there, some passed-away. When I was talking with them I don't know how much happy I was!. Sometimes tears filled my eyes. There was an Ammachi(This term is used, mainly by Christians, to mean mother/Old Women) can you guess what's her age? she is now 103. She has become almost blind but she remembered me, I am still in her mind I was so happy. Another ammachi almost 85, she was staying alone. When we visited her home she was surprised to see us. She was very much happy that she hugged everyone of us and cried with joy. Most of the time during this visit I was speechless and was enjoying their immense love. I came back to home but my mind was still wandering in Niranam. Every nook and corner of that place and my old home (that is not there now) is clearly saved in my mind. I'm saying this because I don't have any photographs of that period or that place. But I can remember every details of that place as it was before twenty years. Sometimes I think If there were a software that could read our mind and convert it into photos or videos, then I could have made a thousands of photos of Niranam. I strongly believe that my wish will come true in future!! Wish all you a happy and prosperous new year. We search internet for software, movies, games etc. Right? But at the end of the search we will land on a website that might be a blogger blog or wordpress blog. Blogger is a service provided by Google. Blogger does not give any space to upload files. So bloggers are depending on online file storage providers like Rapidshare, MediFire, DepositFiles etc to host their huge files. File downloading from these online file storage providers is not a smooth process as they make restrictions like countdown timer, countdown timer + CAPTCHA, file download limit etc. 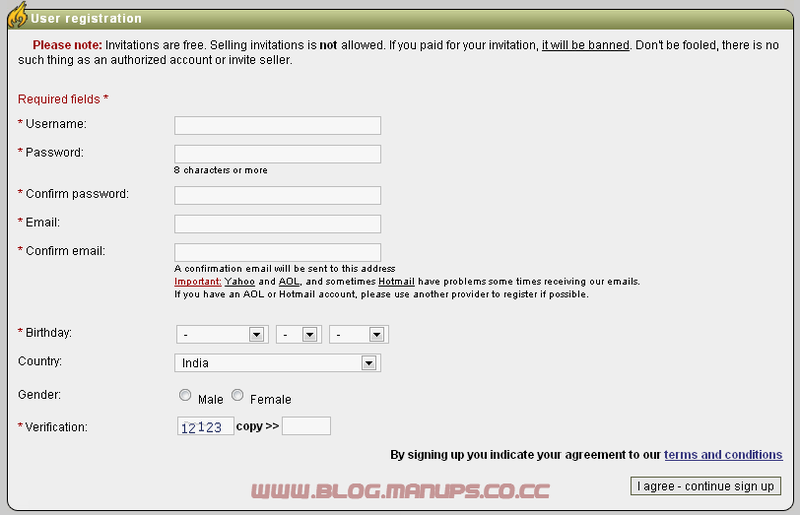 To overcome these restrictions users have to become a member on these provides. But according to me I think is not a good choice because there is no use if we become a member on any one of the provider. The reason is that different bloggers use different online file storage providers. I have already mentioned about one the programs in my previous post, that is JDownloader and that's my favourite. Another one is FreeRapid Downloader. The technology beind JDownloader and FreeRapid Downloader is Java. So both are platform independent. FreeRapid Downloader which works with downloading from Rapidshare and other file-sharing services. Just copy your links from a browser to this application. FreeRapid Downloader will take care of the rest itself. No more clicking or uncomfortable waiting. You can download FreeRapid Downloader from the link provided below. Comment on your favourite downloader. The Stop Online Piracy Act (SOPA), would authorize the U.S. Department of Justice to seek court orders against websites outside U.S. jurisdiction accused of infringing on copyrights, or of enabling or facilitating copyright infringement. The pending Stop Online Piracy Act (SOPA) bill seeks to bring down many popular sites, one of them is The Pirate Bay. But companis like Facebook and Google is opposing this bill. Installing this Mozilla Firefox browser add-on, users can access blocked website's content and access services even if the DNS servers of their local ISPs block them. Just turn DeSopa on and the browser will send the user request to DNS servers outside the US. DeSopa will cache the IP response of valid servers to resolve future DNS requests faster. Click on the light blue DeSopa button in the Status/Add-on bar, at the bottom of the browser window, to access websites by IP. 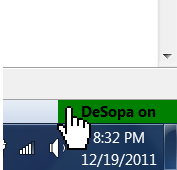 Click the green DeSopa button to switch back to DNS resolution. Buy the world’s cheapest tablet now!! The Aakash aslo known as the worlds cheapest tablet $35 is an Android tablet jointly developed by DataWind and the Indian Institute of Technology Rajasthan. The Indian government already ordered 100,000 units of Aakash. Aakash is now available to be ordered from its official website. Students in India will get Akash at discounted price of Rs.1750 for others, it will costs Rs.2,500 (approx $47). Order your Aakash tablet now or pre-book your Ubislate7 (the upgraded version of Aakash) today! 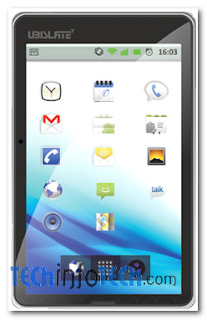 Aakash tablet can be ordered now (cash on delivery) and the delivery will be done in a week’s time. The official site announced an upgraded version of Aakash, named UbiSlate 7 is available for pre-order. UbiSlate 7 have a bigger battery ,3G capabilities and can be used as Mobile Phone.There is definitely no other touch pad tablet or computing device anywhere near the price of Aakash tablet or Ubislate 7. It is a new generation device which comes with attractive features. This is the world’s cheapest tablet pc. This tab is made for the requirement of the users and especially for student needs. Microsoft has launched a new product, Windows Defender Offline beta. Its based on Windows Anti-Spyware. The feature of this product is that it is designed to be executed from a DVD or USB flash drive even before Windows starts up. The recent versions of windows contains the Windows Defender program. The normal windows defender starts on the basis of windows services, so it will run only after windows start-up. Sometimes rootkits or other malicious program may overrun, because they will be loaded even before windows defender stared. 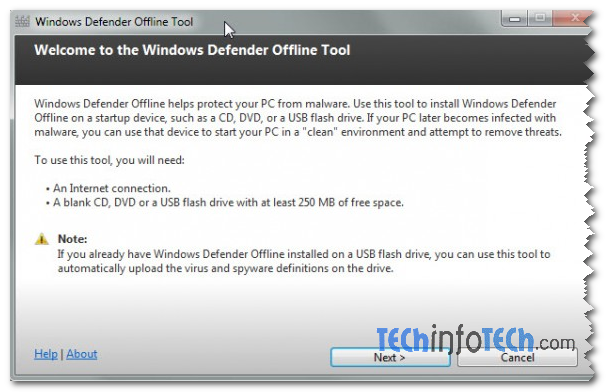 To overcome this situation Microsoft has introduced Windows Defender Offiline beta. Windows Defender Offile is designed to scan your system for malware such as root-kits, or viruses that aren't constantly running processes and only act at start-up or at unpredictable random times. To do this, it needs to be installed on a removable media. Windows Defender Offline interrupts the normal Windows boot process with the familiar Windows Defender interface. Through the interface users can choose to perform quick, full, or custom scans of the Windows system before it begins running. The program is offered for 32-bit or 64-bit web installer. Please choose the right version of the installer for your system. The web installer downloads 250 MB of data. The data can be burned to CD or DVD, put on a USB flash drive or saved as an ISO file. Now use the newly created DVD or USB media to boot the system and scan for malicious programs. There are many other programs similar to this, I have tested windows defender offline beta, I cannot say that it is too good or too bad. Overall I can say that it is an above average product. There are lots of websites from which we can send free SMS, but these websites have limited services and many drawbacks. I feel that most of them are filled with tons of advertisements, pop-ups etc. So its not comfortable, I mean that sometimes we only have to send one or two SMSes but because of these mess-ups it will take lots of time. I have already posted about free SMS services like FreeSMS client and Yahoo Messenger. Now the FreeSMS is not working. Yahoo Messenger SMS delivery is ok but it has services in limited countries. JaxtrSMS is a new service from Sabeer Bhatia, the founder of hotmail. It allows you to send free SMS to any mobile number across the world. 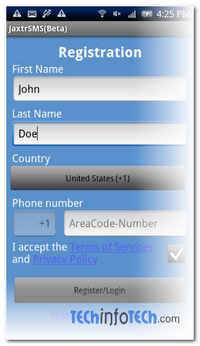 The attraction and plus point of JaxtrSMS is that you can use your own mobile number as sender ID. First you will have to register with the service using your mobile number and then verify your account with the link you receive to your mobile in SMS. Once you have confirmed the number, you can start sending free SMS. JaxtrSMS app is available for major platforms like Android, iOS, BlackBerry, Symbian, Java and Nokia phones. After a successful installation, using the app interface you can access contact list and select the mobile number you want to send SMS, enter message and hit send, that's it. If the receiver doesn’t have JaxtrSMS app installed, messages will appear as a normal SMS in their phone. I have tested the app on Android platform and the service worked smoothly. Make sure that you use the correct country code while sending the SMS. You can download the app for any of these mobile platform from here.Don't worry, app for Windows Phone 7 can be expected soon. Just to let you know, demonoid.me is open for registration. Demonoid indexes torrents uploaded by its members and categorizes torrents under Anime, Applications, Audio Books, Books, Comics, Games, Miscellaneous, Movies, Music, Music Videos, Pictures, and TV. To register for a free demonoid account, just visit this link at the end of this article, enter your username, password, email, birthday and the verification code. I have come across a lots of problems I had already mentioned, now I'm in a new place, a new home. I have finally got internet connection from BSNL a few weeks ago. 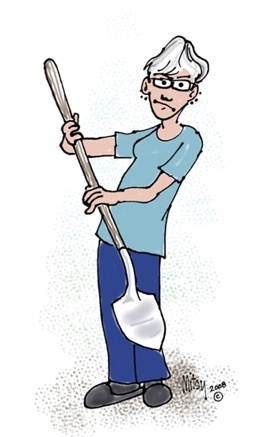 The person for section in charge at local telephone exchange said "There is no worker to DIG (for telephone cabling) and I'm not supposed to DIG"
"We could have provided the connection within 14 days at that time (when I applied ie: september) but now the situation has changed!!" This was said when I made an enquiry about the status on October last. So I decided to mail [not email because they will never respond to it :) ] a letter to the BSNL authorities using the "Right To Information Act, 2005". I got the reply after two days(only the reply not the connection) and after some days finally I got internet connection!